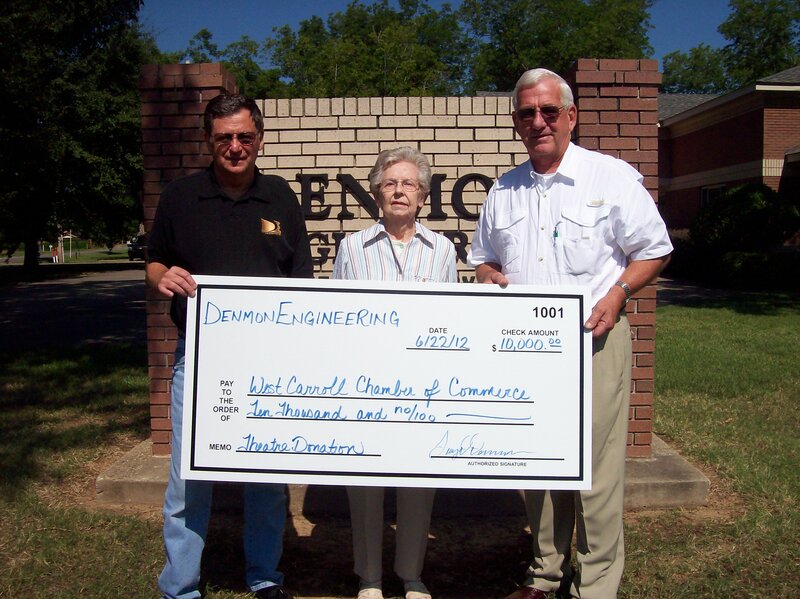 Pictured Left to Right: Terry Denmon, Mrs. Doris Denmon, and Chamber President H. Dough Ainsworth. Oak Grove native and successful businessman Terry Denmon propelled the West Carroll Chamber of Commerce’s Operation 2012 Committee closer to its goal of $30,000 to be used to restore the Fiske Theatre in Oak Grove, La with a donation of $10,000 toward the project which includes replacing the seats, repairing and painting the ceiling and replacing the front doors. As of press time the tally to date stands at $22,183. Donations are still being accepted by the chamber and can be made by visiting your neighborhood Regions Bank (Instruct them to contact the Oak Grove Branch for Account Information) or by contacting John Elliott at 318-428-9626 or Robyn Creech at 318-282-9996. The committee is also currently accepting bids for the painting portion of the project. For more information on the bidding process contact Adam Holland at 318-282-6938. The Fiske Theatre is owned by the West Carroll Chamber of Commerce and operated by Holland Entertainment LLC of Oak Grove. All contributions to the Operation 2012 Project will be used for theatre restoration with no funds being used for general theatre operations. Project books are available to the public upon request.